New York City is the global center of science media. 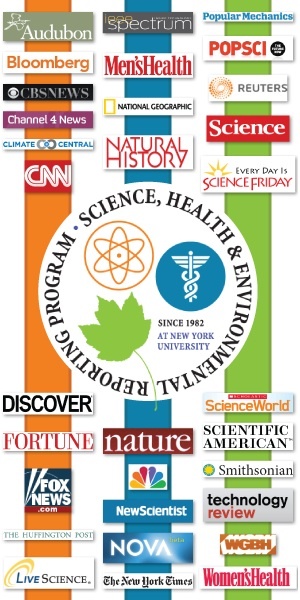 Ever since SHERP began in 1982 (it was known as SERP back then), we have always capitalized on our location by forging strong relationships with dozens of leading science, medical and environmental publications, stations, networks, web sites and publishers based in New York, as well as general-interest media that cover science. Many of those outlets have SHERP graduates on their permanent staffs, and they’re eager to offer prize internship slots to the program’s students. (To see where hundreds of SHERP graduates are working now, visit the alumni page.) SHERP interns write, produce, fact-check and edit stories, all the while learning how high-level science journalism really works from the inside. Our students perform so well as interns that every year several are offered and accept full-time jobs at places where they interned. Some SHERP students intern at specialized publications such as Scientific American, Gizmodo, Audubon or Space.com, while others cover science-related topics for non-specialized outlets such as New York magazine, NBC News, The New York Times or Quartz. Almost all of those internships are paid. SHERP regards journalism internships to be so important, both as vital learning experiences and as a practical route to professional success, that all of our program’s students are required to complete two for-credit, supervised internships during their final eight months of the sixteen-month SHERP sequence. Starting early in the first semester, SHERP’s internship coordinator works closely with the students, helping them to polish their resumes and cover letters and identify internships that match their interests. SHERP also hosts a Meet the Editors and Producers reception every fall where students mingle with dozens of prospective employers, including many alumni. After internships begin during the summer, the internship coordinator follows up to make sure SHERP students are getting the most from their internship experiences and to assist with job searches and career advice. Every SHERP student also writes a candid assessment after completing an internship, to be read by students in subsequent classes. If you are representing a media organization and would like SHERP students to know about internship and/or job opportunities at your company, please contact SHERP Internship Coordinator Rene Ebersole.